Muscle or electromyogenic (EMG) artifact poses a serious risk to inferential validity for any electroencephalography (EEG) investigation in the frequency-domain owing to its high amplitude, broad spectrum, and sensitivity to psychological processes of interest. Even weak EMG is detectable across the scalp in frequencies as low as the alpha band. Given these hazards, there is substantial interest in developing EMG correction tools. Unfortunately, most published techniques are subjected to only modest validation attempts, rendering their utility questionable. We review recent work by our laboratory quantitatively investigating the validity of two popular EMG correction techniques, one using the general linear model (GLM), the other using temporal independent component analysis (ICA). We show that intra-individual GLM-based methods represent a sensitive and specific tool for correcting on-going or induced, but not evoked (phase-locked) or source-localized, spectral changes. Preliminary work with ICA shows that it may not represent a panacea for EMG contamination, although further scrutiny is strongly warranted. We conclude by describing emerging methodological trends in this area that are likely to have substantial benefits for basic and applied EEG research. 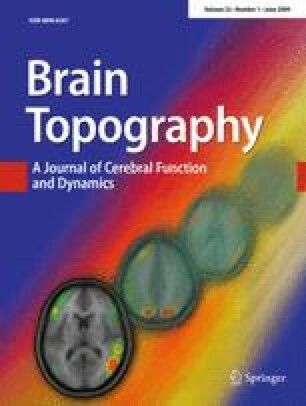 This article is one of five on the “Special Topic: Discussing Gamma” in issue 21(3) of Brain Topography. This work was supported by NIMH grants P50-MH52354 and MH43454. We thank David Bachhuber, Bridget Kelly, and Adam Koppenhaver for assistance.